NOTE: Tickets typically sell out in a matter of hours once released. Regular tours are approximately 90 minutes and include the historic Castle's main floor and basement, extensive grounds and cactus gardens surrounding the Castle. Guests are greeted by Tovrea Carraro Society Certified Volunteers at the Visitor Center and taken through the Carraro Cactus Gardens on a tram with a docent. The tour winds through the beautiful 44 acres, viewing the outer buildings, before arriving at Tovrea Castle. Other Special arrangements should be made at least 2 weeks prior to your tour date and time, particularly for assistive devices for hearing and sight impairments. Be advised that tours for commercial touring companies are priced at a higher rate and are very limited and not available through these regular tours. 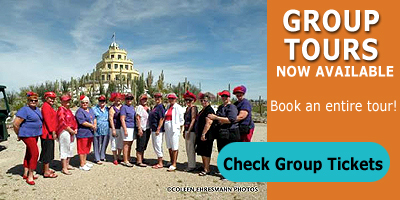 If you are interested in booking a tour through your tour management company, please contact us for special pricing and dates at tours@tovreacastletours.com If you are a commercial touring company and book anyway, we will cancel your tickets. Due to occupancy limits, tours must be booked in advance. Tour tickets are sold on a first come first serve basis. You can purchase a tour ticket online by clicking a ticket category above or by calling 1-800-838-3006 and speaking to an agent.